They're not supposed to look like this right? Has anyone seen this before, and do you know what I might have messed up? Hey Tenka it's a HDT bug that should occur very rarely, solved by saving and loading. Did you force V-sync in your TESV.exe, if not you should.And FPS limit should be 60. Oh good it's a known thing. Thank you! :D Those things though, I uh, don't remember. Sorry for the newby questions but could you remind me how to go about forcing V-sync in TESV.exe? I found iFPSClamp in skyrim.ini, it was 50 but I'll see how 60 does. 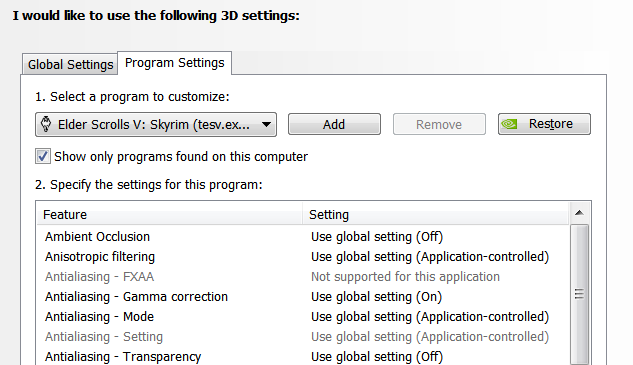 I haven't found a v-sync setting in skyrim.ini or skyrimprefs.ini or an option in the skyrimlauncher.exe. If using a Nvidia card got to Manage 3d settings >>> program settings >>> add TESV.exe to the list >>> scroll down and where you see V-sync from the dropdown menu press ON >>> apply.